This Cottage Oak front door was fitted by our installers in Redmile, Vale of Belvoir. As a conservation area Redmile and the Vale of Belvoir often have to comply to Brown belt regulations and therefore a traditional timber door is to be installed. We have installed many new front doors in Redmile and the surrounding area, from solid oak to bespoke composite doors. If you require a front door installed in the Vale of Belvoir call us on 01157401740. Although very interested in the benefits of our composite doors this couple were required to have a traditional hardwood front door to stay in keeping with the look of the surrounding properties on the street. They had to stay in keeping with the brown belt specifications of the area. For this reason they chose to install a hardwood door with minimal glazing to as to improve the energy rating of the property. 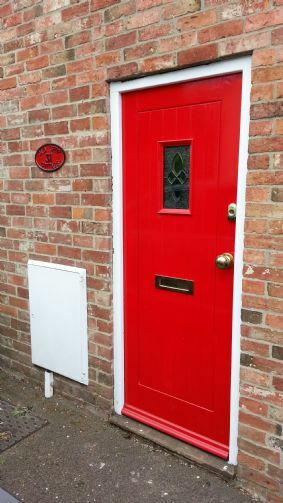 Rather than stick to the traditional oak finish of this door we have painted it a stunning poppy red and it is now the main feature of the high street in the village! We fitted this door in replacement of a similar style but softwood and very old which was very insecure and not up to modern standards. Redmile is in the Vale of Belvoir and comes under the Melton Parish of Leicestershire in the NG13 postcode.